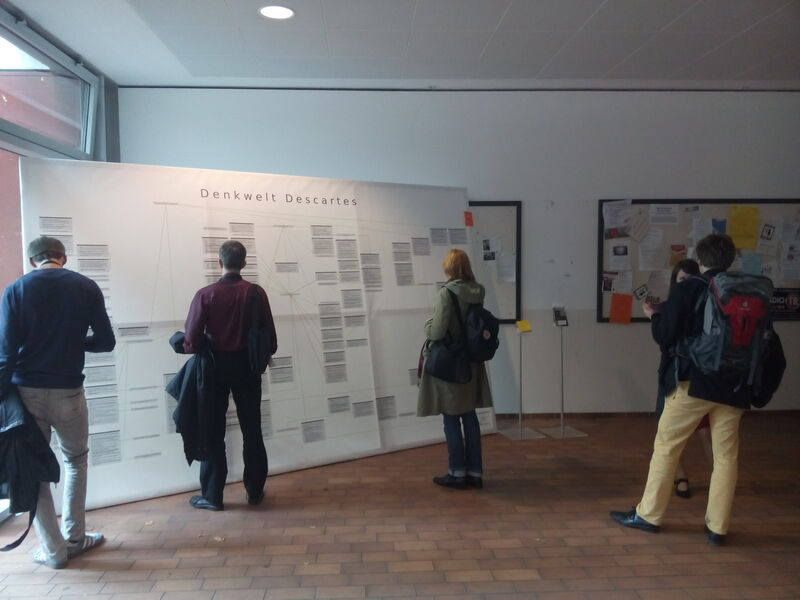 At the GAP.9 in Osnabrück (conference of the Gesellschaft für Analytische Philosophy) I presented a big argument map using Gregors arguments in his commentary on Decartes Meditationes. 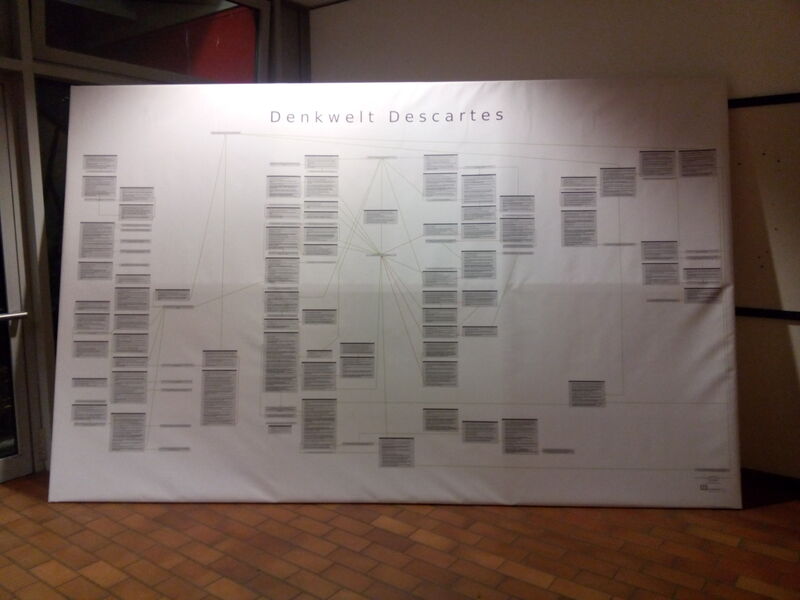 It was called “DenkWelt Descartes” and was handmade with YEd to show all arguments unfolded with all premises at once and graphs pointing not at whole arguments but at the premises or conclusions itself. The resulting map (2,5x4m) was added to the poster session of the conference. Some looked at it from distance – taking it more as a piece of art and a representation of philosophical complexities. Some tried to figure out parts of the Meditiationes they knew (especially the cogito-argument and the arguments for the existence of God), asked for a brief introduction into the idea of argument maps or simply wondered if they were meant to read it all. Both was fine for me, since it was originally made as an exhibit for DenkWelten (www.denkwelten.net), an association of several young German philosophers to found the first museum of philosophical ideas, trying to combine exactly visual work with philosophical ideas. In any case a little help and commentary was needed to get into the map. Finding a good layout was hard, since automatic layouting couldn’t cope with the text or made the many inferential connections hard to track. So I stuck to the idea to make the graphs as easy to follow as possible. This way “God exists and he is perfect” ended up right in the middle connecting many arguments, what made the argumentative goal of Descartes harder to detect – which might not be what Mr. R.D. (and even Mr. G.B.) originally intended… but what can at least now be discussed fully stretched out on PVC.